It’s time to open a new conversation. Adopt a secure-by-design architecture Industrial Internet of Things (IIoT) for real-time data communications. 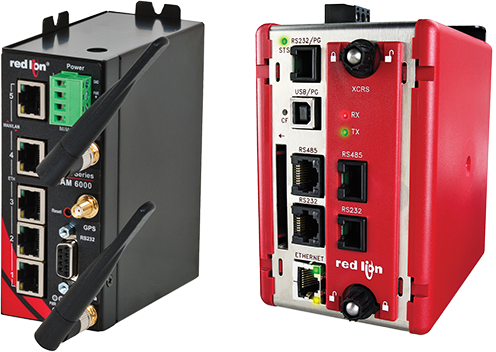 With the Skkynet embedded toolkit installed on your Red Lion Sixnet® series RAM® cellular RTUs or IndustrialPro® cellular routers you can view your data on the Web, feed an industrial SCADA platform, or connect to other devices and systems. Additionally, installing a Red Lion Data Station Plus protocol converter provides you the ability to communicate bi-directionally with over 300 industrial protocols to seamlessly integrate legacy equipment. Stream your data right where you need it – for one-way monitoring or two-way control. Connect to our end-to-end solution and immediately tap into an industrially hardened communication technology that works in the plant, on the cloud, or both. No programming is required. Achieve networking speeds of only a couple milliseconds over network latency while reducing your data usage by as much as 60%. Deliver the experience of being on-site; see process dynamics as if you were there in person. In minutes, you can now seamlessly tunnel/network your device data into virtually any SCADA system; visualize your live data using a full featured Web-based HMI on the Web or in-plant; increase the value of legacy equipment with powerful protocol conversion; connect to SQL, MySQL, OSI PI, Oracle or any ODBC compliant database for easy read and write capabilities; connect to OPC clients and servers; configure email/SMS notifications; connect live data to Excel spreadsheets (DDE) for real-time calculations; use our open API support for custom applications; bridge between other data servers; or consolidate data from multiple sources. Need to customize your solution even more? In addition to defining dead bands and update frequency, the Skkynet Embedded ToolKit also includes a robust scripting language to optimize your implementation. 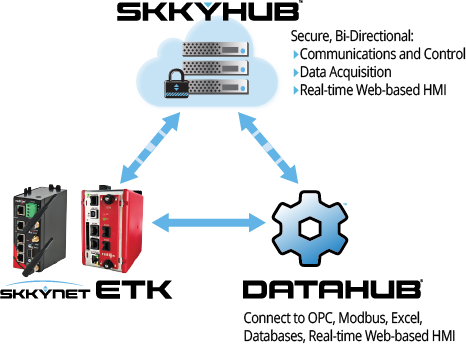 The Skkynet Embedded Toolkit (ETK) provides a direct link to the SkkyHub™ service, which provides a seamless, end-to-end solution for M2M, viewing data from your device on the web, connecting to other web services, or transporting your data anywhere in the world. The Skkynet Embedded Toolkit provides a direct link to the Cogent DataHub® for end-to-end connectivity to in-plant systems without any programming. The Cogent DataHub is a hardened industrial middleware that connects OPC servers and clients, Modbus TCP slaves ODBC databases, Excel, and .NET programs to your Red Lion enabled devices, and supports OPC networking, bridging, redundancy, email/SMS notifications, process trending, and much more.